With 100s of underwear for men options to choose from, buying the best underwear for your needs can take a little research. 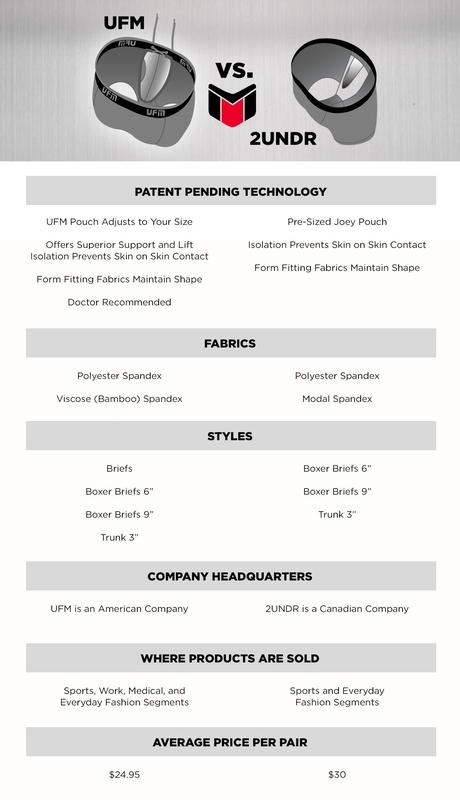 UFM and 2UNDR are a style of underwear for men called pouch underwear. Pouch underwear has a contour pouch built into the front of the underwear to provide isolation and prevent skin on skin contact. Most pouch underwear styles are made from form fitting lightweight, breathable fabrics designed to provide more support than traditional briefs or boxers. If you’re deciding between UFM and 2UNDR, this chart below should help give you a good sense of how we stack up.